Guava Basil Moscow Mule. A twist to the traditional refreshing Vodka cocktail made with spicy ginger beer, guava nectar, fresh lime and sweet basil. Delicious drink for any time of year! 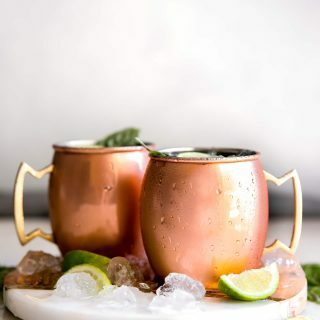 Fill 4 copper cups (or any cocktail glass) with ice. Pour 2 ounces of vodka, 2 ounces guava nectar, and 3 ounces of ginger beer into each cup. Squeeze a tablespoon of fresh lime juice and a basil leaf into each cup. Stir then serve with more basil leaves and lime wedges. Enjoy!